Congratulations to Gretta Teets on winning the 2018 Leg-Up Raffle Foal! Thank you to everyone that participated and purchased tickets! This year's raffle foal is Tarantino d'Avalon (ES Toronto x Emmanuelle d'Avalon/Edelweiss de Bonce) a stunning, bay colt, born March, 2018, by the Elite KWPN stallion, ES Toronto and is out of one of Avalon Equine's best warmblood broodmares, Emmanuelle d'Avalon (Edelweiss de Bonce x Dixieland Jazz d'Avalon/Don Prinipe). This colt's sire, ES Toronto, has produced multiple offspring that have competed to successfully in Jumping, as well as eventers and dressage horses. He has also produced multiple Elite mares and a fully licensed son. Tarantino's dam, Emmanuelle d'Avalon is by the Grand Prix Dressage stallion, Edelweiss de Bonce - a beautiful, elegant stallion with some of the very best in sporthorse breeding in his pedigree. Emmanuelle is out of Dixieland Jazz d'Avalon who is sired by the Grand Prix Dressage stallion, Don Principe. Emmanuelle's pedigree reads like the Who's Who in dressage breeding. Tarantino is showing himself to be a beautiful, bold colt with lovely, correct movement, and an elegant type. This colt is bred to EXCEL and will certainly make someone a competitive partner and should shine in whatever discipline you would choose. You better bring your "A Game" when showing this foal as you WILL be noticed! He is going to make someone a stunning performance prospect that will get you noticed in the show ring. Tarantino d'Avalon is located in Wynnewood, Oklahoma so the winning ticket holder would need to arrange transport from there. For more information on her, you can contact Avalon Equine at office@avalon-equine.com. Westfalen N.A. has generously donated the cost of inspection and registration of this foal! The final drawing and announcement of the winner will be December 31st, 2018. The Raffle shall end on December 15th, 2018. Drawing will take place on December 31st, 2018. Ticket sales will begin August 19, 2018 and run through December 15th, 2018. This shall refer to the promotional period. The Grand Prize for winning the Raffle shall be the Westfalen foal, Tarantino d'Avalon. Leg-Up Equestrian Aid Foundation shall cover all costs associated with the foal for up to 14 days after the winning ticket has been drawn. The winning ticket holder shall be responsible for all costs associated with transporting (including but not limited to, health papers, required testing, transport costs, etc.) said foal to the winning ticket holders location. All costs associated with transporting the foal shall be at the winning ticket holders expense. Board for any time after said 14 days shall be at a rate of $20.00/day. The Prize is neither transferable nor exchangeable and cannot be exchanged for money or money’s worth. This should not be construed as limiting the right of the winner to sell or re-home the winning foal after they receive it. 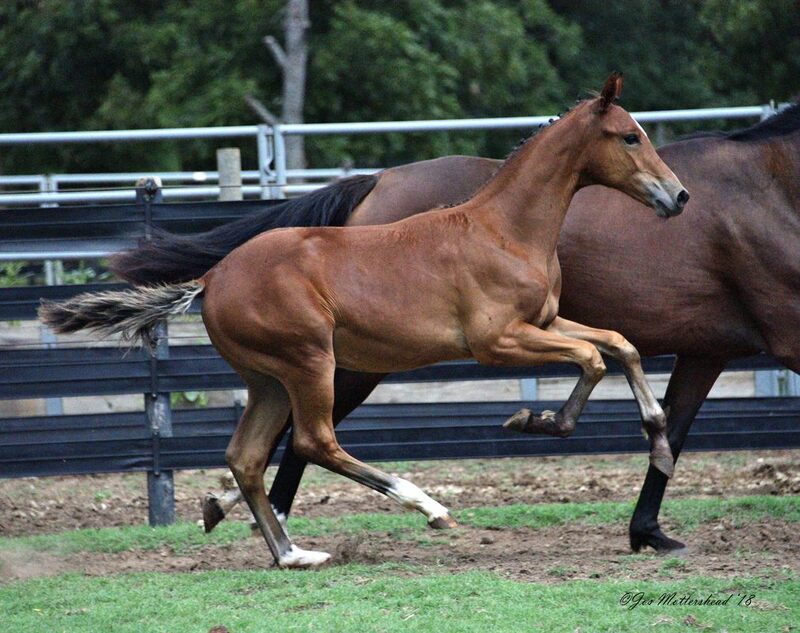 Winning entrant states that they have the ability to properly house, feed, handle and care for a foal and agrees to an onsite inspection and approval of premise prior to accepting delivery of foal. If the premise is deemed unsuitable, winner agrees to make whatever changes necessary to comply with the inspector, or agrees to relinquish ownership of the foal back to Leg-Up. Winning entrant agrees to provide periodically updates and photos of the foal as well as occasional onsite checks, if deemed necessary. Winning entrant also agrees that they are fully able and capable of caring for and raising a foal, including but not limited to adequate feeding, housing and training of said foal. If at any time, it is deemed that winning entrant is unable to properly care for said foal, winning entrant agrees to return the foal to Sponsor and any and all fees paid for purchasing raffle tickets shall be refunded. Nothing in these rulse shoul be construed as limiting the right of the winner to sell or rehome the winning foal after they take possession, care and custody of said foal.